Name this building! Built while Old Main was going through renovations in 2005, this building still serves as the home of the nursing and education departments. Is this building: A. Anderson Social Science Center B. Prairie View C. Confer Hall D. Mattson Hall The answer will be posted at 6:00 p.m. CST. 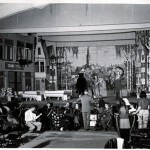 Here are students performing the opera The Bartered Bride in 1951. Feel free to post your comments below! 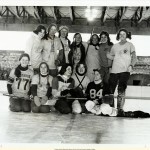 What memories do you have of programs, buildings, or activities at Gustavus or in St. Peter that no longer exists? 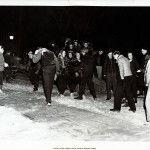 Snowball fight, circa 1940 Where might one find some other awesome photos and facts like the one above? 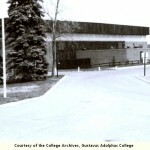 Visit the College Archives at https://gustavus.edu/library/archives/. 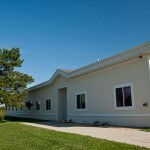 This week’s Tuesday Trivia question is: What building was completed in 1975 and replaced the Myrum Fieldhouse? A. Sorenson Hall B. Lund Athletic Center C. Sohre Hall D. Southwest Hall The answer will be posted at 6:00 p.m. CST.